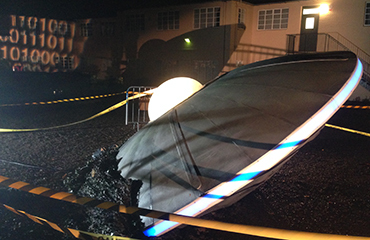 When we were asked to build a crashed spaceship, it was like a dream come true. 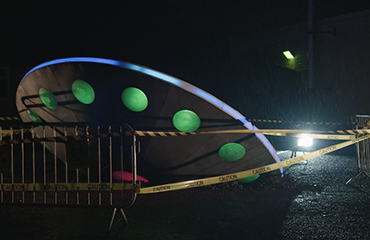 We created a 5m diameter flying saucer complete with sequenced illuminated propulsion circles, LED edge strip. and smoke billowing out from the inside. 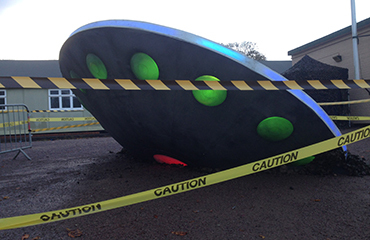 It was the eyecatching centerpiece of the Sci-fi film event at Bletchley park for which it was commissioned. We built the spaceship in two halves in our workshop, and then cut off the sections that would be "buried" in the ground. 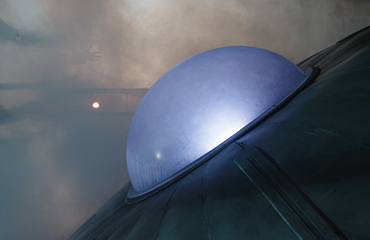 It was important for us that the spaceship sculpture should have as many blinky, flashing sci-fi lighting effects that we could reasonably produce, so we created a spinning lED light effect around the rim of the saucer, and used vacuum formed shaped circles to create illuminated "propulsion" circles on the underside. A few more DMX controlled lights on the inside as well as one of our smoke machines and the piece really came together. We designed it to come apart into two halves which went to the event on a flatbed truck, for final assembly on site. The reaction from the kids at the event made it all worthwhile, and the kids flocked to see it and have their photo taken next to it. The spaceship sculpture really came into its own at night however, when the internal lighting created a truly spooky atmosphere when lighting up the smoke seeping out of the underside of the saucer. We couldn't help but have some fun with the actors on site by filming a sci fi film moment of our own as you can see in the promo video.